A transformational college access program awaits. There are staggering numbers of exceptionally talented, critically minded, academically promising individuals who are experiencing real structural barriers to higher education. As a nation, we are not sufficiently investing in our local talent; the change agents of tomorrow. At the HLLC, our commitment is to cultivating the innovation necessary to solve local and global issues. There is arguably no one better equipped to help solve these pressing public concerns than students who have firsthand experience of their impact. These students’ keen insight and critical analysis, as a result of their experiences, make them invaluable assets to our campus community and to their fields of study. Most students’ first exposure to higher education is through community colleges. As a result, the HLLC seeks to admit students from community colleges, GED programs, and high schools throughout Newark, greater Newark, and beyond. We envision that admitting these students will significantly enhance their lives, and will immensely benefit our college community and the world. The HLLC looks at the admissions process a little differently than most university honors living-learning communities. We begin by defining “honors” differently, looking much deeper into student potential than is possible through only blunt instruments such as standardized test scores. HLLC engages potential students in in-person interviews and group simulations to see how they employ multiple intelligences in collaborative problem solving. This process helps to reveal who students really are, what their talents are, and what they can bring to an incredibly diverse and challenging learning environment like Rutgers University – Newark. By expanding the admissions process, the HLLC provides an opportunity for students to live and learn together, and offers an innovative curriculum focused on “Local Citizenship in a Global World” that honors a wide array of talents, skills, and knowledge. The HLLC aims to support the development of students to become thought leaders within their fields, positive collaborators within their communities, and change agents in our world. Rutgers University-Newark, the anchor educational institution in and of New Jersey’s largest city, is a leader in research and scholarship, fostering excellence at the intersection of academic and civic engagement. With an enrollment of more than 11,500 students, its undergraduate, graduate, professional, and joint degree programs span more than 100 areas of study within seven schools and colleges. All students who apply to RU-N are invited to interview with HLLC. Click here for the presentation shared during the Parents session. The Honors Living-Learning Community offers a variety of experiences designed to cultivate your personal, social, and academic growth. By engaging a broad base of faculty, staff, students, and external stakeholders with wide-ranging professional expertise, HLLC provides you a unique opportunity to diversify your skill sets and explore new areas of learning. The curriculum will engage you in existing RU-N collaborations in Newark and in the local-global connections of publicly engaged scholarship and education. HLLC’s challenging curricular and co-curricular experiences will expand your learning beyond the classroom and integrate it with your daily campus and community life. Visit HLLC curriculum overview here. A specialized pathway for students to earn undergraduate degrees in humanities disciplines, paving the way to graduate school, and academic careers and careers in related fields. All students selected for HLLC, regardless of financial need, will receive a residential scholarship that covers housing and meal plan expenses for four academic years (eight semesters) for first-year students and two academic years (four semesters) for transfer students. All applicants are required to complete the Free Application for Federal Student Aid (FAFSA) annually for federal, state, and institutional aid assistance. You can file for FREE at www.fafsa.ed.gov. All candidates who file the FAFSA are automatically considered for all federal, state, and institutional funds for which they may be eligible. Currently, HLLC students live together in selected areas of RU-N’s residence halls—an arrangement that significantly enhances opportunities for out-of-class learning and fostering relationships. As of 2019, HLLC students will be housed in a new, state-of-the-art facility designed specifically to support the HLLC’s innovative academic and extracurricular practices, which aim to activate social, institutional, and cultural change and to facilitate engagement with the people and places of Newark, New Jersey’s largest city and cultural capital. At Rutgers University–Newark, we are committed to offering a quality education at a great value. We are known for being an affordable option, and we also provide scholarships and financial aid. Learn more about your affordable options at https://admissions.newark.rutgers.edu/paying-for-college. What is the HLLC admissions process? 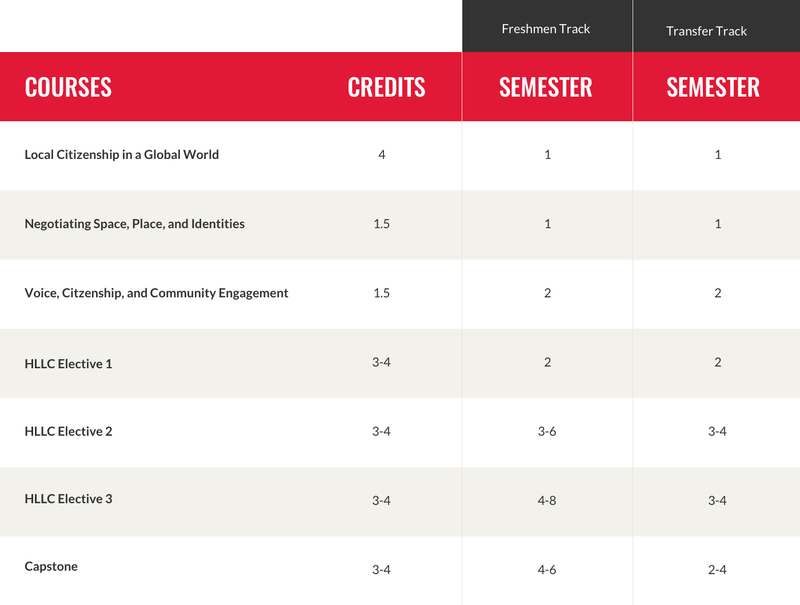 Unlike traditional criteria utilized to measure success within a college environment, this Rutgers honors program seeks to redefine merit and relies heavily on both academic indicators and additional criteria to assess a student ‘s ability to thrive. This process includes a two-phase interview process – a large group interview and an individual interview – and a written personal statement for students that have passed onto the second round. What is the purpose of the HLLC interview process? The interview process measures how well students will adapt to, and persist within the HLLC environment, measure individual attributes that foster success throughout college, and identify students whose values and ideologies are consistent with the philosophy, mission, and goals of the HLLC. The large group interview session will have about 200 students, separated into groups of ten students each. Each group will engage in four categories of various activities supervised by two evaluators. This process usually takes about three hours. What does the large group interview involve? The interview involves various activities that are not only entertaining, but more importantly, measure how well students will acclimate to, and operate within the HLLC community, identify qualities and attributes that best indicate how well a student will function within a cohort, and measure how well a student’s goals and values align with the mission of the HLLC. What does the individual interview involve? The focus of the individual interview is to measure individual attributes that foster success throughout college and student potential, and allow evaluators to gain insight into the unique stories of each applicant, and the strengths and assets that each applicant will bring to the HLLC.